The entire world is feeling the impact of established and emerging artificial intelligence techniques tools. This is transforming society and all areas of business including healthcare and biomedicine, retail and finance, transportation and auto, and all verticals. Marketing and communications is certainly being transformed through artificial intelligence techniques. Manufacturing is at the beginning of a major upheaval as automation and machine learning rewrite the rules of work. We are seeing applications in construction and additive manufacturing, as well as self-driving vehicles and industrial robotics. Robotic systems, the Internet of things, cloud computing and cognitive computing collectively make up what is termed "Industry 4.0." The first three stage were mechanization, mass production and basic automation. Artificial intelligence is already impacting every industry, powering search, social media, and smartphones and tracking personal health and finances. What’s ahead promises to be the greatest computing breakthrough of all time, yet it’s difficult to discern facts from hype. That is exactly what EmTech Digital tries to accomplish. The panel was moderated by MIT Technology Review editor in chief Jason Pontin. Peter Norvig, Director of Research for Google, talks about developing state-of-the-art AI solutions for building tomorrow's intelligent systems. Andrew Ng, formerly Chief Scientist with Baidu who in 2011 founded and led the Google Brain project, which built the largest deep-learning neural network systems at the time, discusses deploying deep learning solutions in practice with conversational AI and beyond. Earlier this year researchers at Heriot-Watt University and the University of Edinburgh recognized, there is a way to tease out information on the object even from apparently random scattered light. Their method, published in Nature Photonics, relies on laser range-finding technology, which measures the distance to an object based on the time it takes a pulse of light to travel to the object, scatter, and travel back to a detector. And now further research has shown significant forward progress. Light lets us see the things that surround us, but what if we really could also use it to see things hidden around corners? This may sound like science fiction, but that’s the idea behind a new algorithm out of MIT’s Computer Science and Artificial Intelligence Laboratory (CSAIL) - and its discovery has implications for everything from emergency response to self-driving cars. 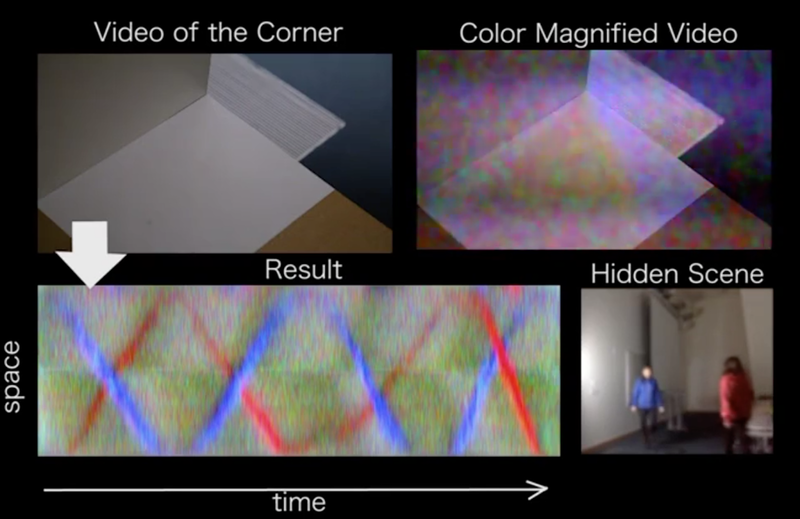 Using video of the penumbra, the system - which the team dubbed “CornerCameras” - can stitch together a series of one-dimensional images that reveal information about the objects around the corner. Bouman co-wrote the paper with MIT professors Bill Freeman, Antonio Torralba, Greg Wornell and Fredo Durand, master’s student Vickie Ye and PhD student Adam Yedidia. She will present the work later this month at the International Conference on Computer Vision (ICCV) in Venice. “If a little kid darts into the street, a driver might not be able to react in time,” says Bouman. “While we’re not there yet, a technology like this could one day be used to give drivers a few seconds of warning time and help in a lot of life-or-death situations." 1-D videos reveal the number of people moving around the corner, their angular sizes and speeds, and a temporal summary of activity. Open doorways, with two vertical edges, offer stereo views inside a room, viewable even away from the doorway. Since nearly every corner now offers a 1-D view around the corner, this opens potential applications for automotive pedestrian safety, search and rescue, and public safety. This ever-present, but previously unnoticed, 0.1% signal may invite other novel camera measurement methods. Certain industries have not traditionally had the luxury of telecommuting. For example, many manufacturing jobs require a physical presence to operate machinery. But what if such jobs could be done remotely? This week researchers from MIT’s Computer Science and Artificial Intelligence Laboratory (CSAIL) presented a virtual-reality (VR) system that lets you teleoperate a robot using an Oculus Rift headset. The system embeds the user in a VR control room with multiple sensor displays, making it feel like they’re inside the robot’s head. By using hand controllers, users can match their movements to the robot’s to complete various tasks. 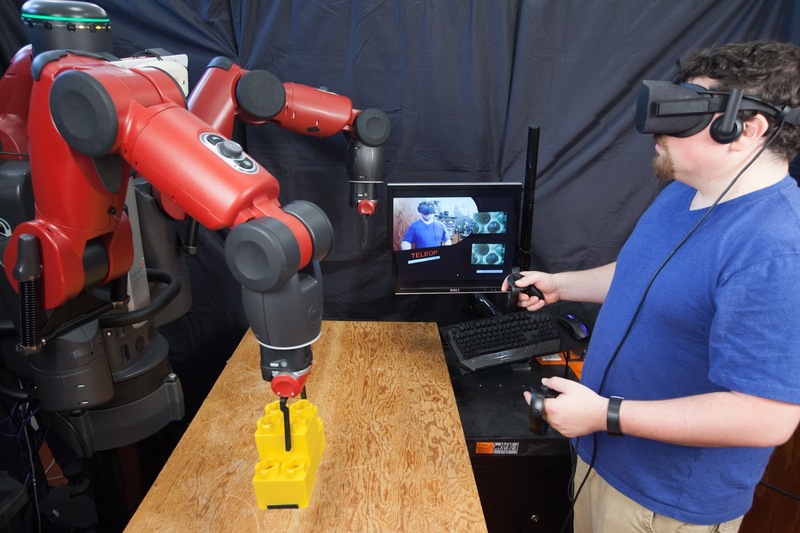 “A system like this could eventually help humans supervise robots from a distance,” says CSAIL postdoctoral associate Jeffrey Lipton, who was lead author on a related paper about the system. “By teleoperating robots from home, blue-collar workers would be able to tele-commute and benefit from the IT revolution just as white-collars workers do now." 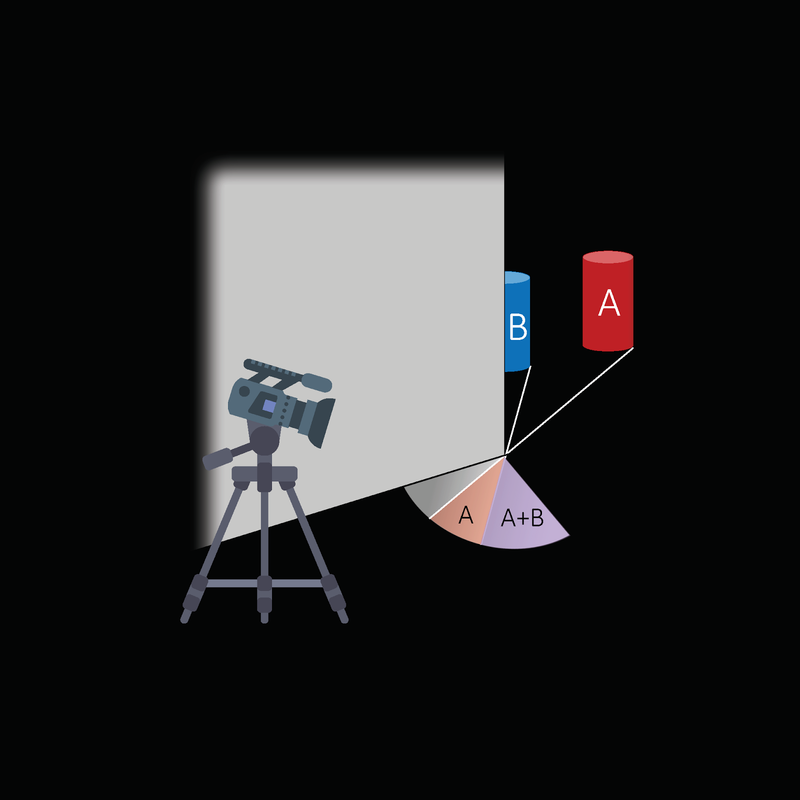 In a “direct” model, the user's vision is directly coupled to the robot's state. With these systems, a delayed signal could lead to nausea and headaches, and the user’s viewpoint is limited to one perspective. In a “cyber-physical” model, the user is separate from the robot. The user interacts with a virtual copy of the robot and the environment. This requires much more data, and specialized spaces. The system mimics the “homunculus model of mind” - the idea that there’s a small human inside our brains controlling our actions, viewing the images we see and understanding them for us. While it’s a peculiar idea for humans, for robots it fits: “inside” the robot is a human in a control room, seeing through its eyes and controlling its actions. The project was funded in part by the Boeing Company and the National Science Foundation.